High mountains. Snow. Bright sunshine and bitterly cold winds. 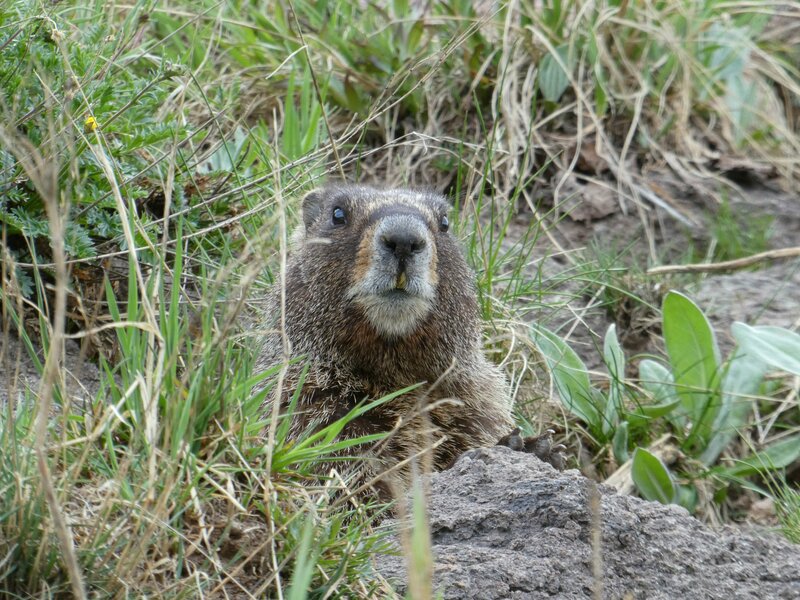 Marmots and pikas scurrying around boulder fields, squeaking their alarm calls as we approached. 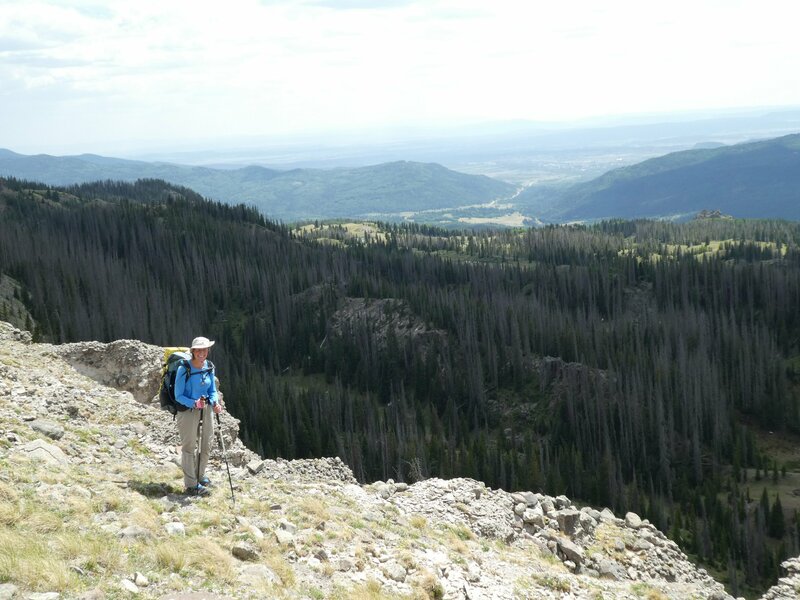 The last few days of hiking since we left Chama have been exactly what we hoped for from the Colorado section of the trail, as we toiled our way through the heat of New Mexico. Not that it got off to a very auspicious start. 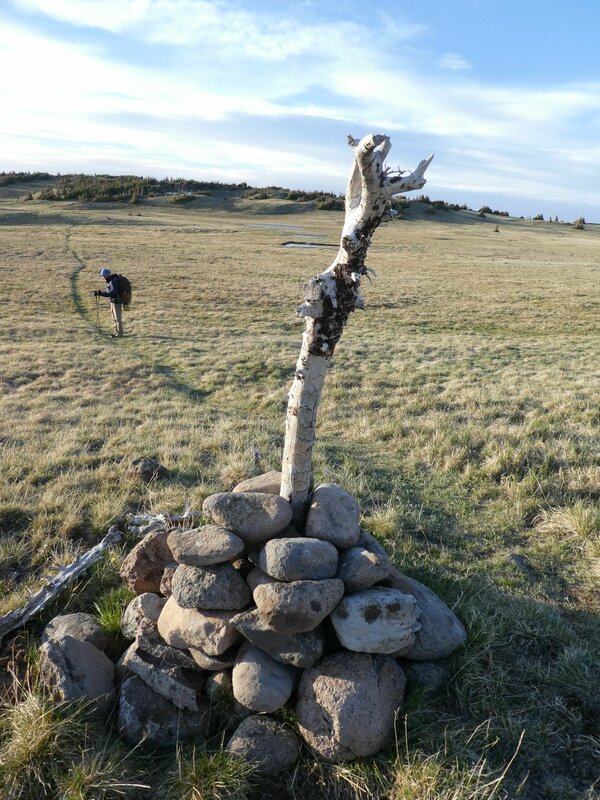 We had dashed around in Chama, collected our equipment boxes from the post office, sorted out what we needed and posted the rest ahead to ourselves further along the trail, done our laundry and bought four days of food. We were pleased with ourselves for doing this in less than a day, and being ready to go the day after arriving in town. We both had dicky stomachs, but optimistically hoped that it was just a result of too much ice cream and beer in town and that it would soon wear off. So we hitched a ride back up to Cumbres Pass to get back on trail. But as we began the steep ascent, we both felt worse and worse. Then we caught up with a hiker we’d met at the motel the night before – he had been hiking with his girlfriend, but she had decided to quit the trail and left him. He had reacted by putting away the best part of a bottle of whisky, and was now hiking alone but barely able to put one foot in front of the other. It’s not in our nature to boss other folks around or tell them what to do, but we decided it would be best for all three of us to head back to town, sort ourselves out, and try again another day. So by the time Neil and I got back to the trail the following day, feeling much better, we were raring to go! 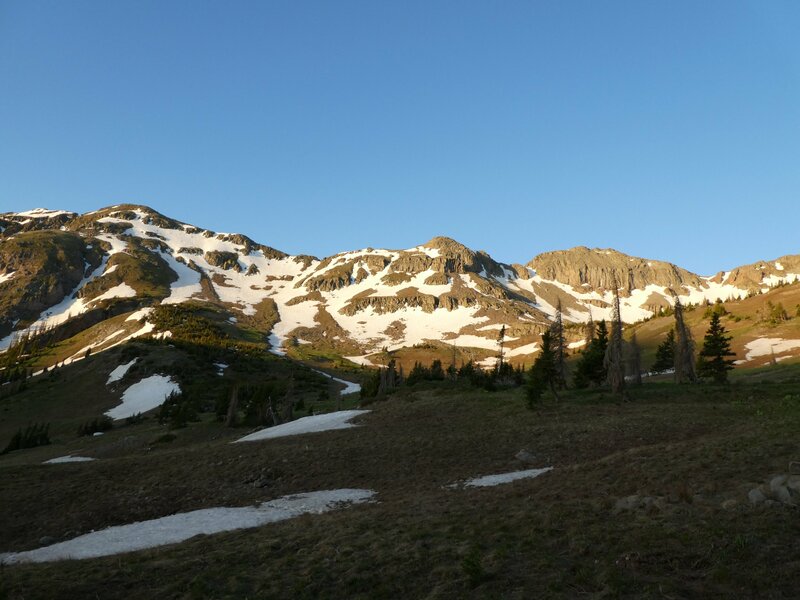 We shot up the steep ascent from Cumbres Pass, and despite spending far too long trying to get photos of marmots and pikas, who live in the boulder slopes at higher altitudes, we made it over Flat Peak (over 12,000 feet) before pitching our tent at dusk at the edge of a large grassy meadow. A herd of elk came out onto the meadow to graze, but as soon as they spotted us they were gone. The following day we caught up with Catwater, a lovely lady from Alaska who we had bumped into in Cuba. 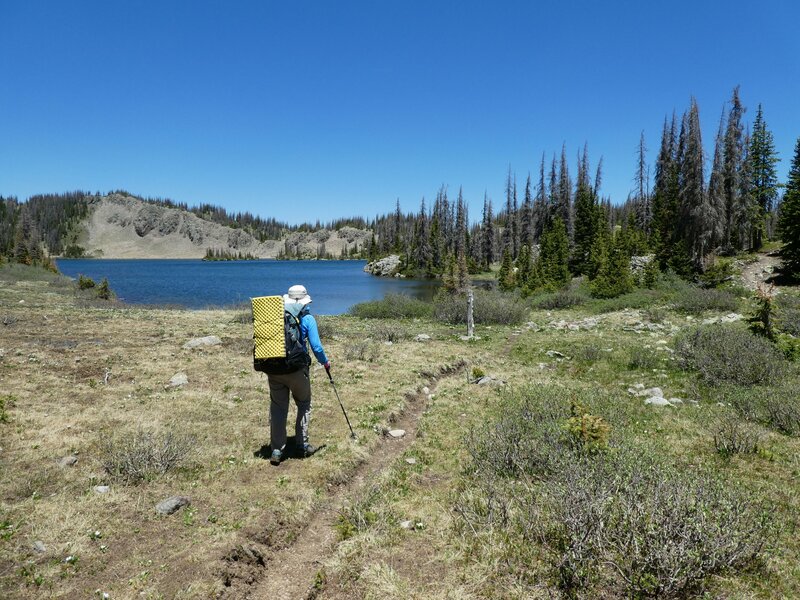 We spent the next 3 days leapfrogging along the trail with her, hiking at our own paces but chatting as we passed each other, and spending some breaks together. The trail took us up onto a long ridge with snow patches and boulder fields, and there was a bitterly cold, strong wind that felt very Scottish! After several miles we dropped down to a less cold elevation, the downside being that it became a veritable rollercoaster of ascents and descents, as the trail wound its way from one valley to the next. By the time we got to a tiny patch of flat land on which we could pitch our tent, we were pretty shattered! So it was a relief the next morning when the wind dropped, and our day’s walking started off with some pleasant traversing around hillsides. 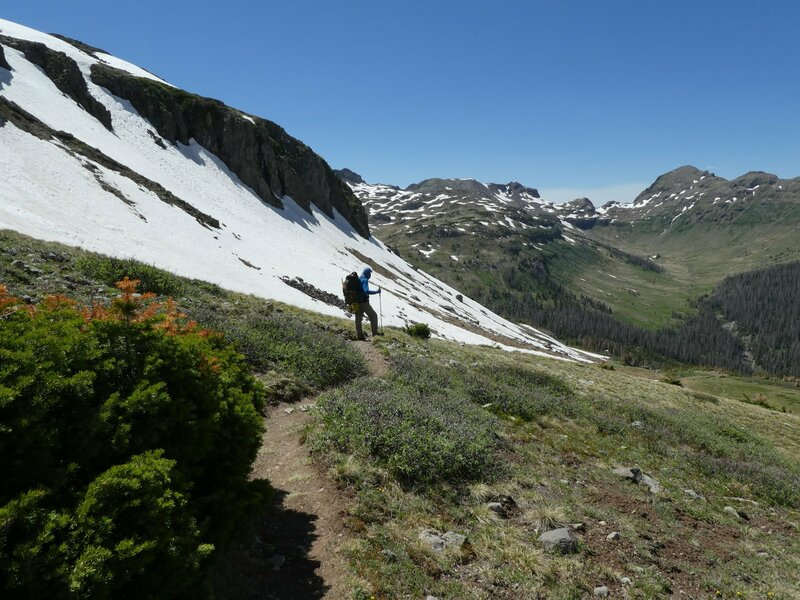 But soon we started to climb, and it turned into a wonderful day following the actual Continental Divide watershed, first on one side and then the other, with long sections well above the treeline and many snow patches to cross. 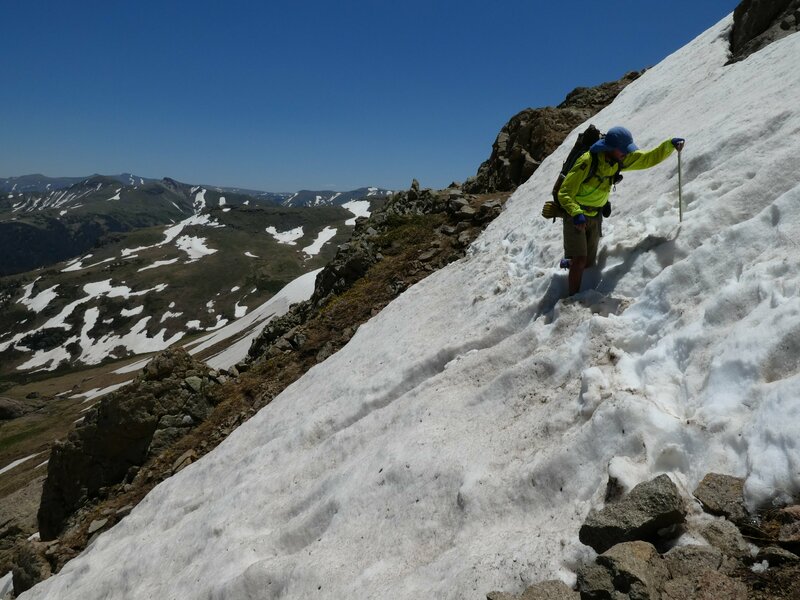 Although we had ice axes with us, most patches of snow were soft enough, with deep enough footprints, to make our way across without any extra equipment. 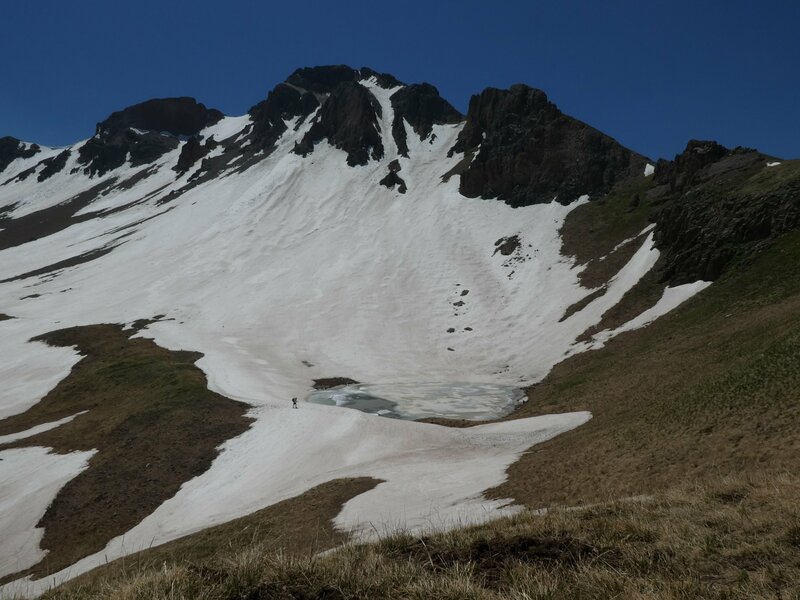 It was slow going, as we went from slushy snow to meltwater-saturated ground to scree, but it could have been much worse. 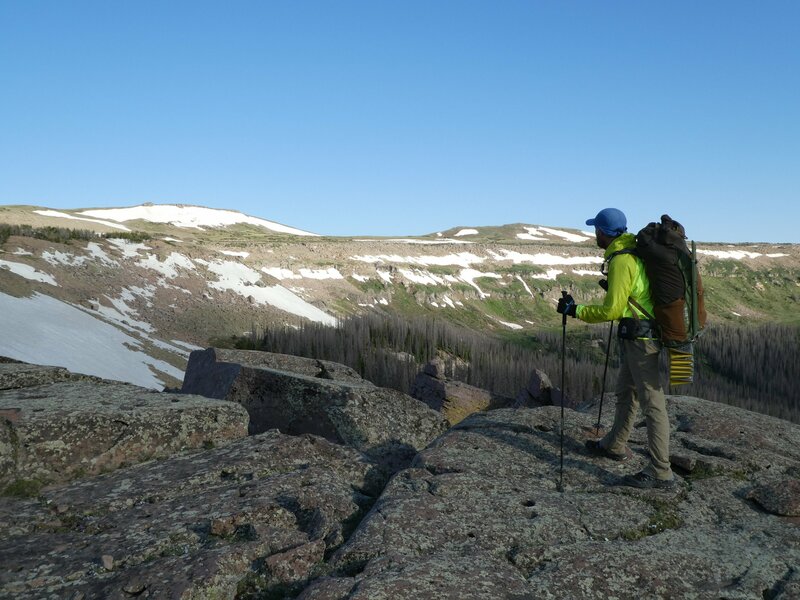 Towards the end of the day we dropped down to Elwood Pass, and we experienced the downside of arriving in Colorado as the snow melts out – mosquitoes. Millions of them. Obviously all hanging out near confusing trail junctions, ready to pounce as soon as we slowed down to consult our GPS / trail app / map. The final few miles of the day were done at a quick sprint until we got to a place where the mosquitoes weren’t! There we met up with Atlas, who we had met on the Pacific Crest Trail in 2012 and again a month ago at Pie Town, and soon we were joined by Catwater as well. 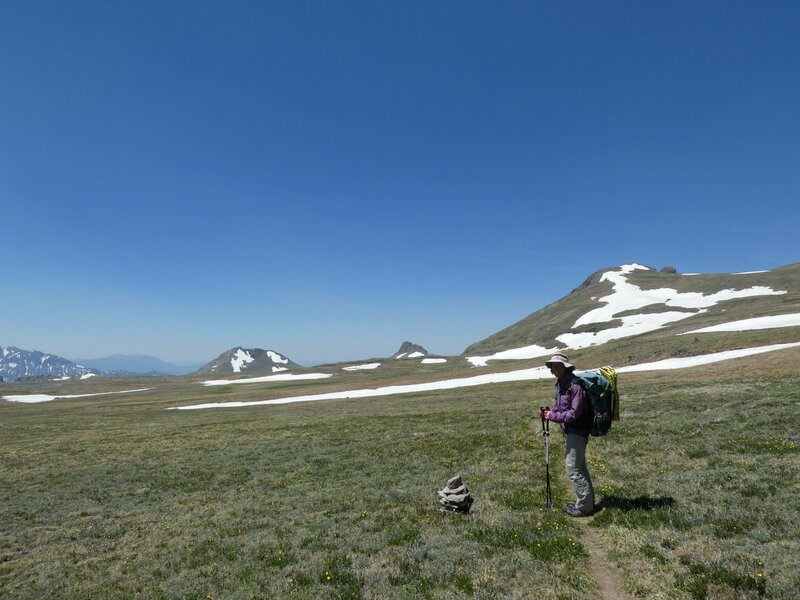 The next morning we were looking forward to a short 12 mile hike to Wolf Creek Pass then a hitch into town to resupply, but Catwater came over with some bad news she had found on the CDT Coalition website the night before – the way ahead was closed. 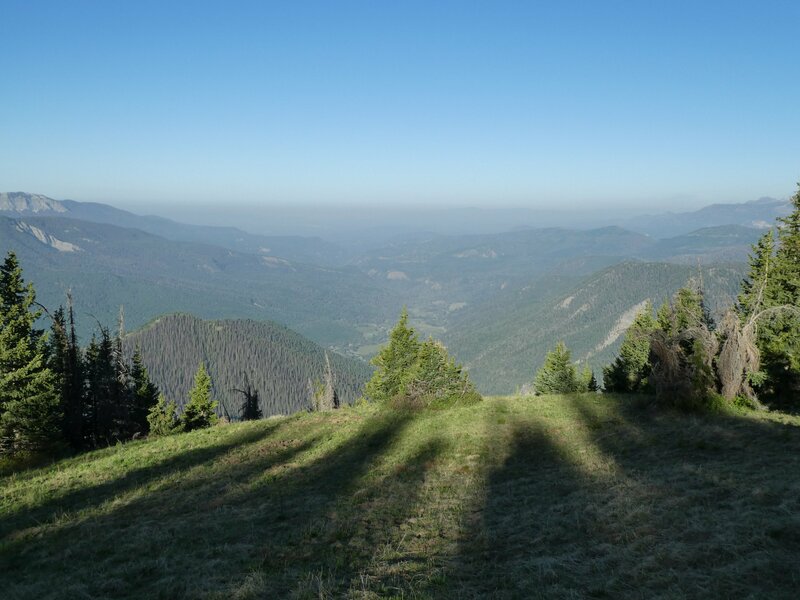 We knew there was a massive forest fire nearby – we had seen smoke collecting in the valleys for a couple of days, and could smell it on the wind – but now the decision had been taken to close the whole of the San Juan National Forest as a precautionary measure because of the risk of further wildfires. 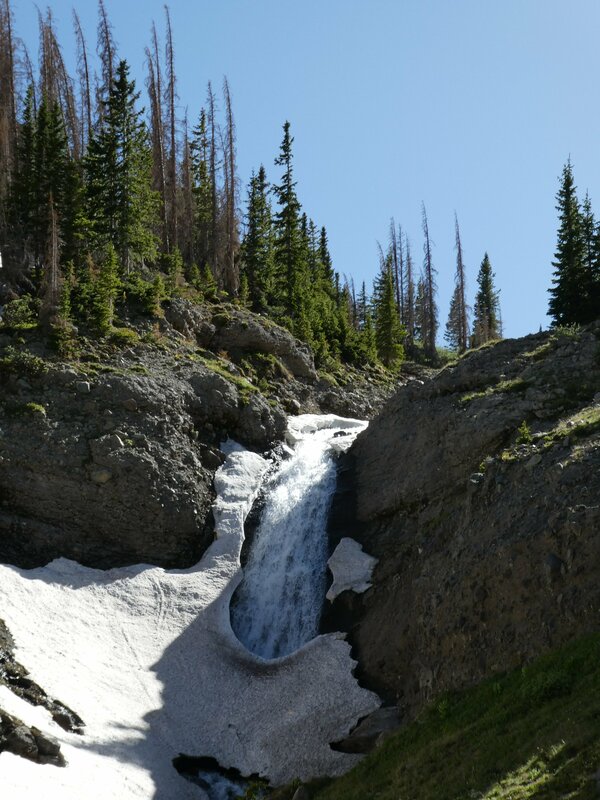 And we had been so much looking forward to hiking the whole of the San Juan Mountains! 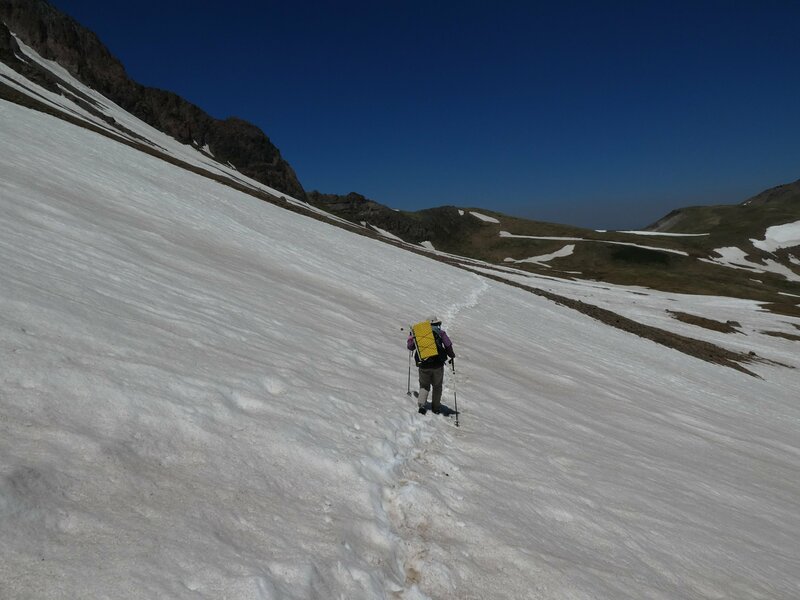 Many hikers don’t manage to do this famously beautiful section of trail because of too much snow, so we thought with it being a low snow year we would be fine. 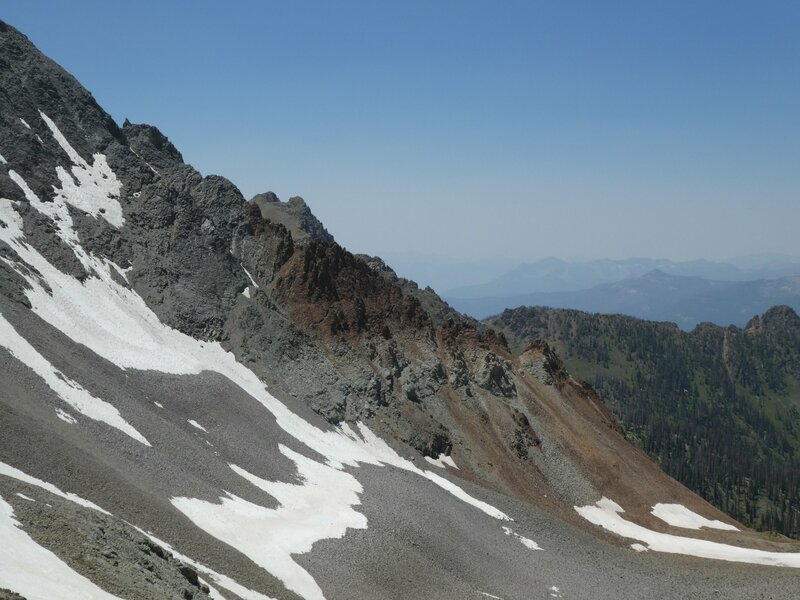 However, with winter snowfall at 10% of its normal total, and huge numbers of dead trees from a combination of drought and the destructive bark beetle, the fire risk is at an all-time high. 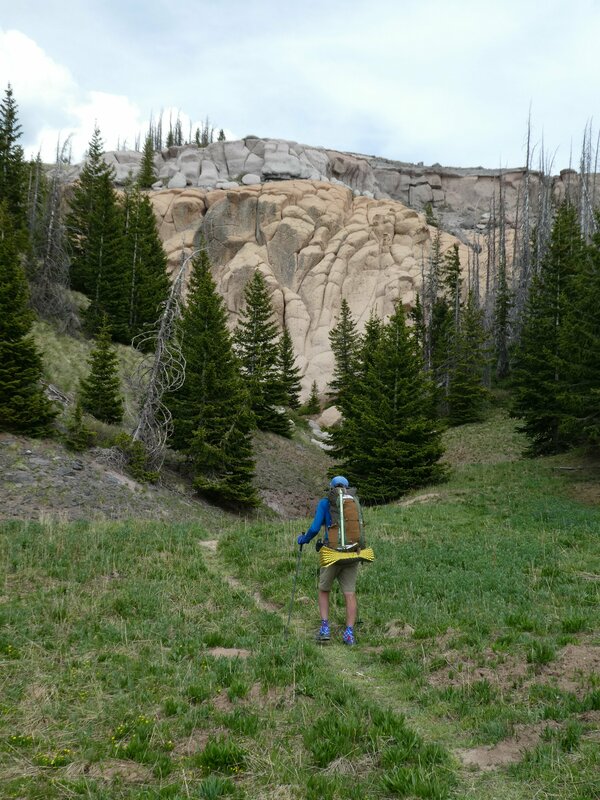 So after talking it over with Atlas, who knows this trail well, we came up with a plan B – we would take the low-level Creede alternative route to bypass the closed area. 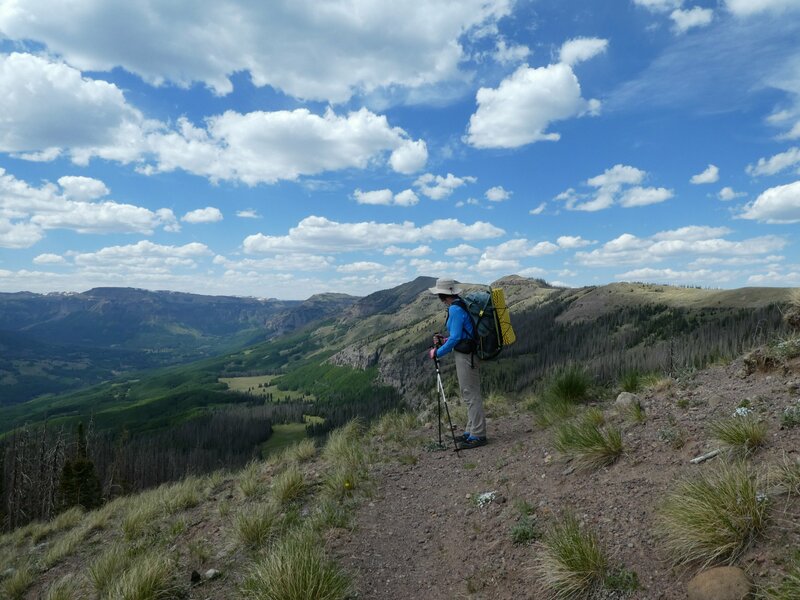 The downside being two very long roadwalks, from Wolf Creek Pass to Southfork, then Southfork to Creede – about 45 miles in total. A bit of a comedown after the excitements of this last section! So now we are in Southfork, allowing our feet a bit of recovery time before hiking on to Creede tomorrow. This trail is full of surprises, not all of them good ones. But we’ll continue to make the best of it that we possibly can. 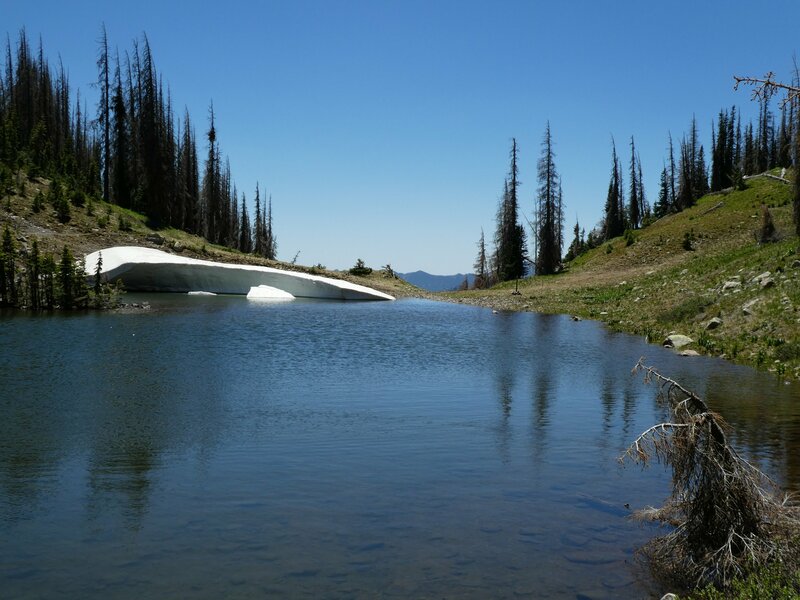 Another snow crossing in prospect? 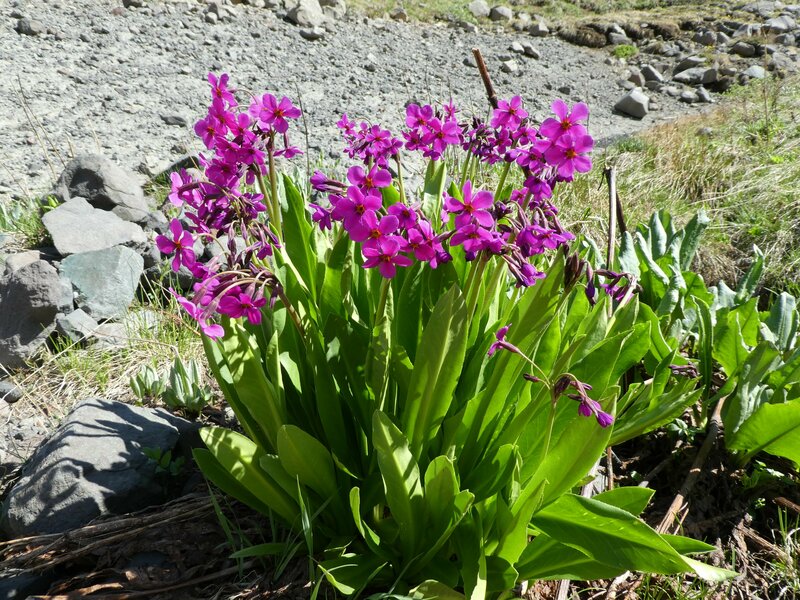 Flowers found near a stream – good excuse for a photographic break on a long ascent! 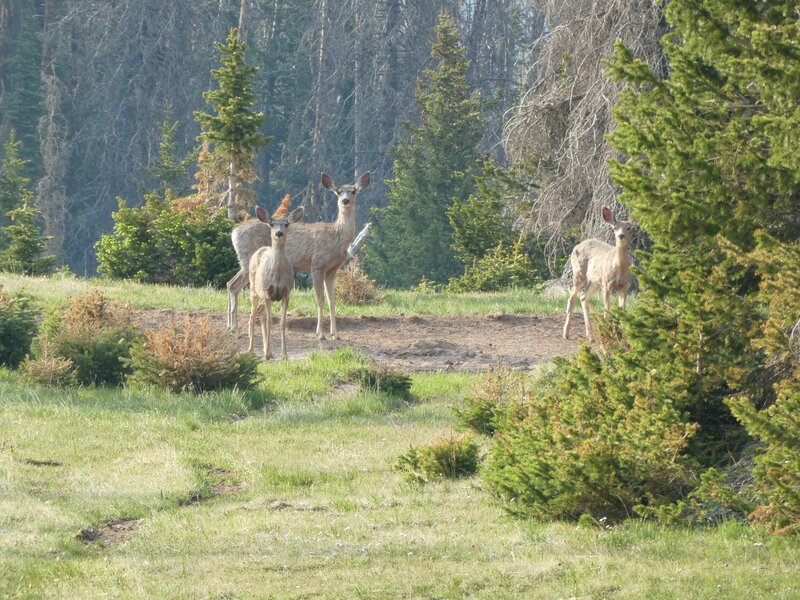 Mule deer – less camera shy than elk! Boo. 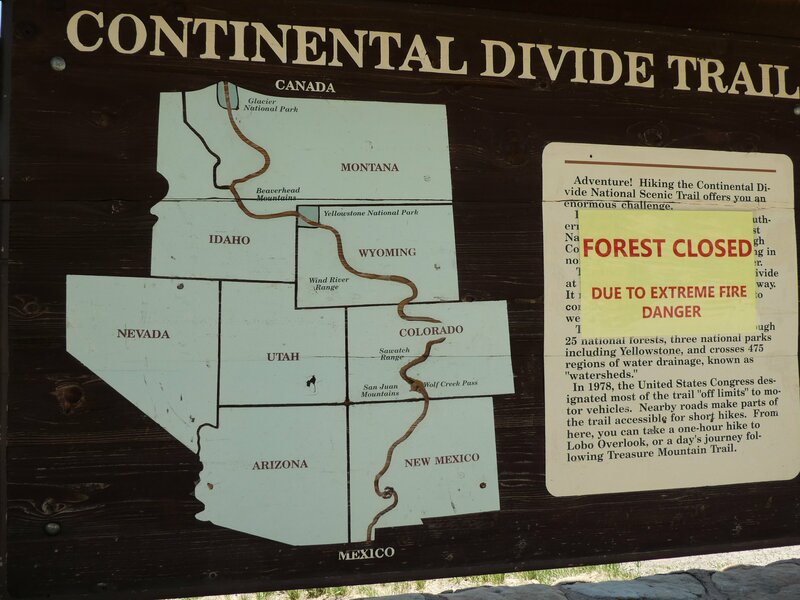 Notice at Wolf Creek Pass. Great photos. Shame about the fires. 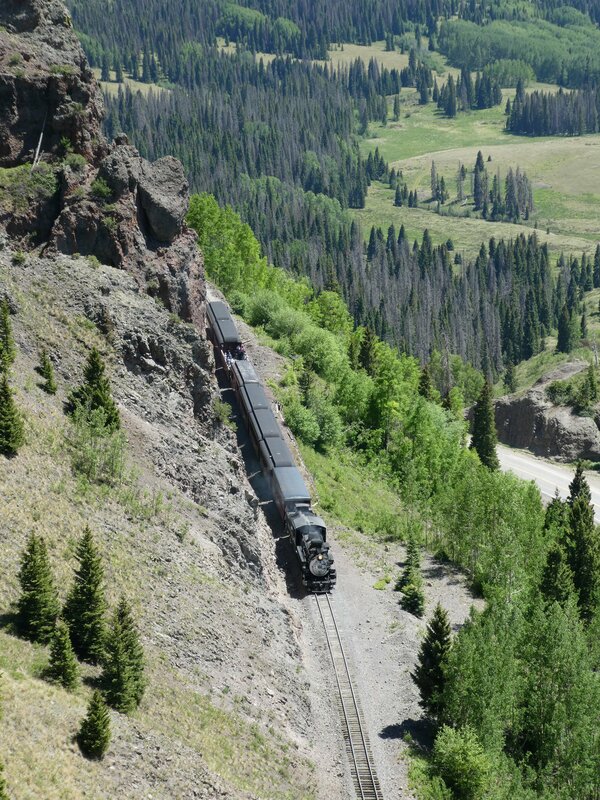 Creede is a great town, I came down of the San Juans from the north through some fabulous restored mineworkers. My route south of there back into mountains involved a best part of a day climbing over blow downs. You will enjoy this state. super hiking guys. great pics. shame about trail closure. really jealous but not of the mosquitos! !